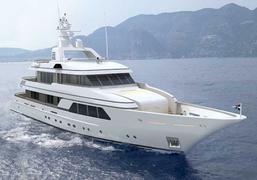 Just launched by Feadship's De Vries yard is the 39m motor yacht Go. The third in the SL39 series, she was designed by De Voogt Naval Architects using a modular design that gives all the refinements of a custom build while retaining a tried and proven basic format. Soft curves and rounded shapes complement the smart and sophisticated looks of this superyacht, a sister ship to Ocean Mercury which was delivered in April 2008.